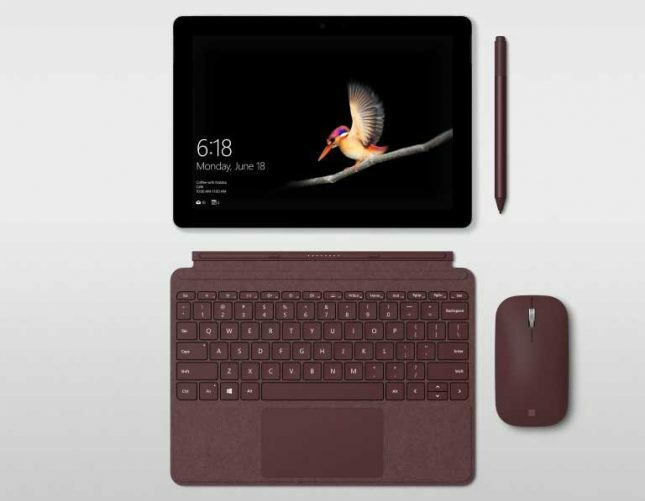 Microsoft has announced a new member of the Surface family called the Surface Go. Microsoft is billing the device as the most affordable and portable surface yet. Surface Go rings in at 1.15 pounds and 8.3mm thick and is a 10-inch device. It has a high-resolution 1800×1200 PixelSense Display that supports the Surface Pen and 4096 levels of pressure sensitivity, low pen parallax, low latency, and precision needed for note taking, drawing, and CAD. The display has a 3:2 aspect ratio and promises to be easy on the eyes while offering the contrast you need when watching videos and performing other tasks. When used in portrait mode it renders a page the size of a typical school textbook and in landscape mode, it can render pages side-by-side as if holding a book in the hand. Microsoft also notes that the tablet is about the size of a composition notebook. The processor under the hood is an Intel Pentium Gold 4415Y with a fanless design. Microsoft promises up to nine hours of battery live and optimized power, performance, and battery life for critical tasks that people perform every day. There is plenty of power to run Office apps and play quality Netflix and Hulu videos. Surface Go has a Surface Go Signature Type Cover available and a precision trackpad. An integrated kickstand holds the tablet up and a Windows Hello camera is integrated. Pre-orders kick off today with products shipping August 2, an LTE model will come later in the year. The tablet starts at $399 with 4GB of RAM and 64GB of storage with an 8GB, 128GB storage version for $549.